How to make your partner smile! This amazing collection includes many of John’s Signature Moves that you won’t find anywhere else, plus lots of ideas to add some pizzazz to your dancing skills. Make your freestyle flashy and fun! Catering for all experience levels, these 12 routines include bonus moves, variations, and interesting entries & exits. The moves vary from simple to complex, from fun to serious, and include some cool drops and lifts. The vast majority of the moves are aimed at increasing your freestyle repertoire so that you can have fun on the dance floor. However, there are a few choreographed moves to give you some ideas if you are thinking of competing, or would just like to look flashy with your regular partner. 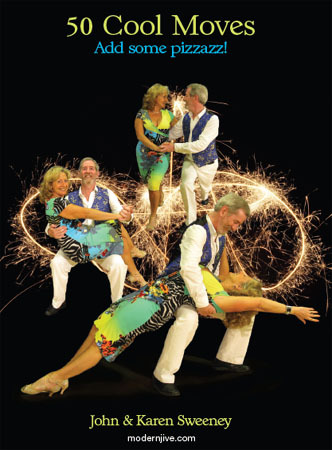 John and Karen Sweeney are freelance Modern Jive teachers, running workshops for countless organizations across the UK, Australia, New Zealand and America. Their successes include multiple Double Trouble championships, Aerials medals and being Jive Masters finalists. John is renowned for his clear and detailed teaching style. His previous DVDs include the best seller, The Modern Jive Tool Kit and Double Trouble Volumes 1, 2 & 3. "Your DVD is really great! Your teaching method is excellent and your explanations are very thorough. Well done!" "Excellent teacher with a solid focus on technique." "I really liked the Modern Jive Toolkit; I have a feeling it will become the Modern Jive bible for dancers." Now you can benefit from this superb personal tuition.